A cluster of heavy showers and storms are organizing near 17 N / 110 W or about 400 miles south of Cabo San Lucas / 410 miles southwest of Puerto Vallerta. It appears to be moving slowly west or west northwest. Last edited by Caribbean Traveler on Sat Sep 06, 2008 11:46 am, edited 1 time in total. 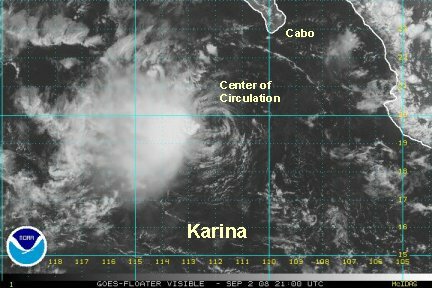 Karina is about 275 miles south-southwest of Cabo and moving away from Mexico. 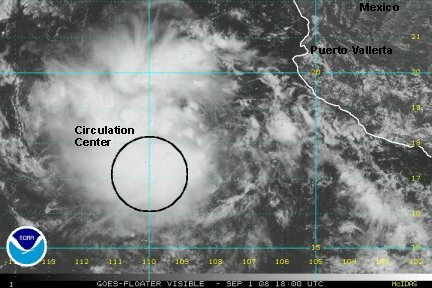 Easterly shear is affecting it and the eastern part of the circulation is exposed. It should continue west, moving away from Mexico. The only effects on Mexico may be a slight increse in swell on the southern Baja. Karina's days are numbered. The deep convection is being stripped by easterly winds. The only deep convection remains on the west side. It continues to move away from Mexico. 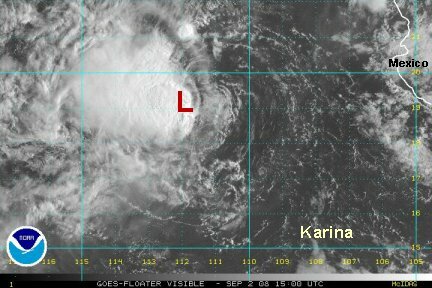 Wind shear has removed the convection from Karina and is not longer any threat. This will be the last update.